Two years ago, at this time, I became a mother. My son, a tiny 5 pounder filled my life with happiness I cannot explain in mere words. 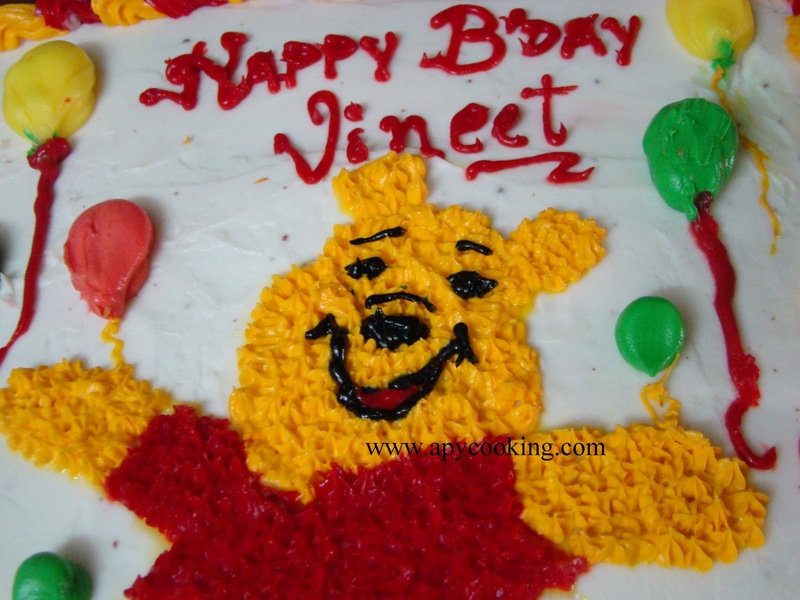 On his second birthday, but obviously, I baked him a cake with one of his favourite characters adorning it. Barney, Mickey Mouse, Thomas the train and Caillou were the other contenders. If I could, I would put them all on the cake. But Winnie the Pooh won the battle and here he is, smiling on my son's b'day cake! I will update this post with more details. For now, let me plant another kiss on my precious li'l darling. As crazy as this may seem, I carried two huge boxes of Wilton buttercream icing ( 4.5 lbs each) with me to India! 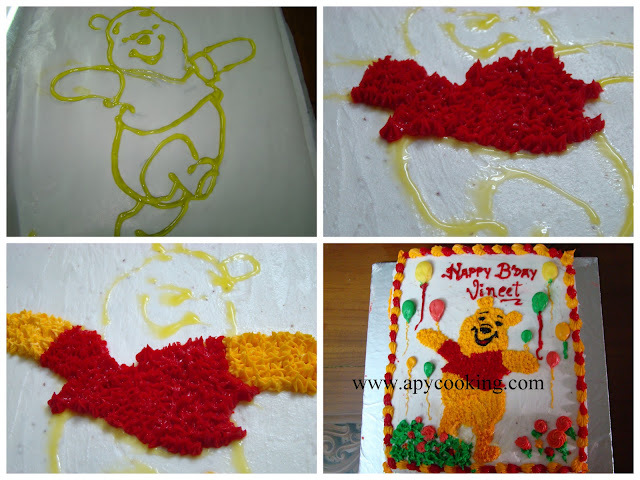 I never made buttercream icing in India before and I did not want to take ANY chance, definitely not for my son's birthday cake, specially when we had a party lined up. 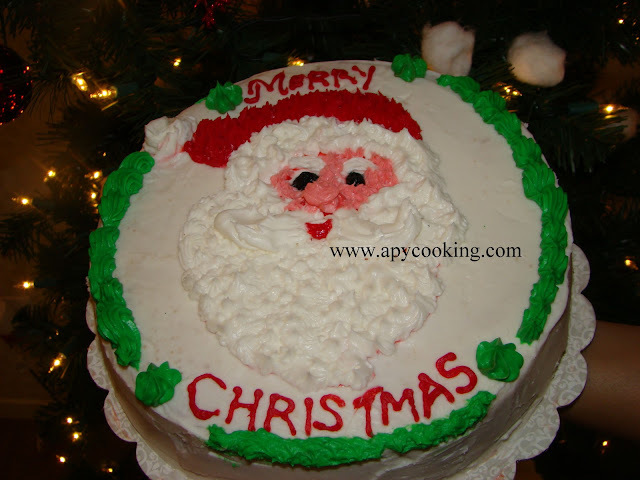 I also took with me a tube of piping gel, red colour and black colour icing. 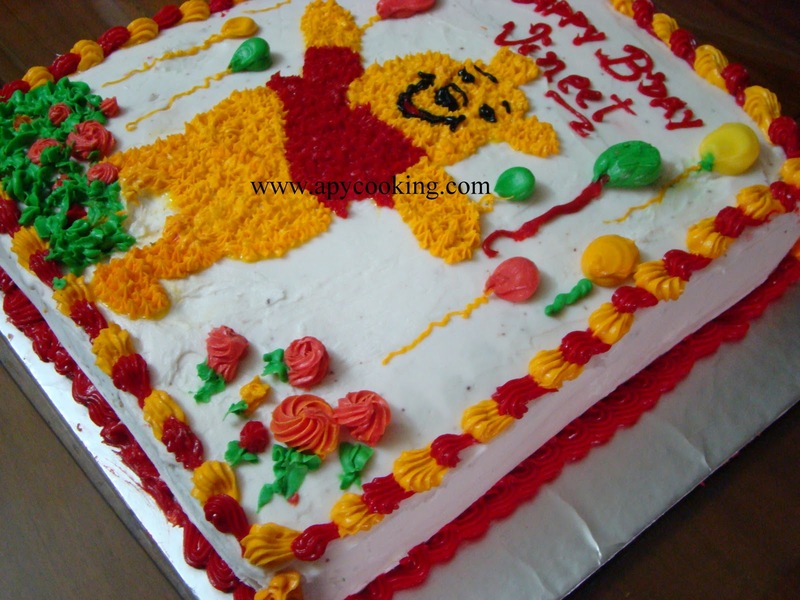 Apparently Wilton sells Pooh icing colour set but I came to know of this too late and decided to mix some colours for the Pooh gold. I made two 10"X11" chocolate cake, layered and iced them using buttercream icing. 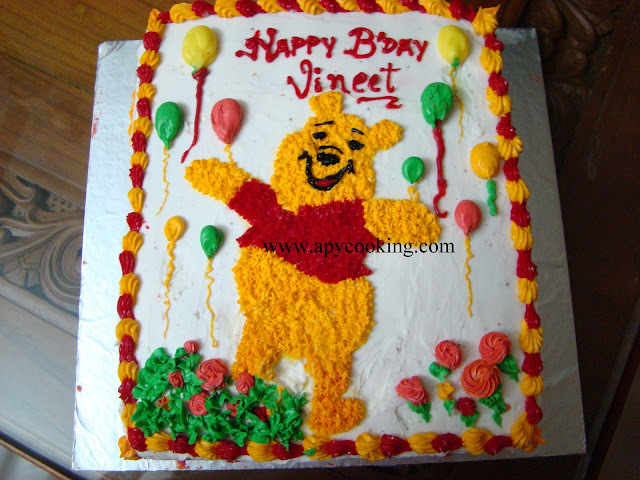 For the pooh gold I mixed white icing with yellow, orange and a little bit of brown to get the desired colour. You will, obviously, get an inverted image on the cake. I used wiltons tips to pipe out the designs - Star tip 16 for Winnie and the flowers and a combination of star tips 18 and 21 for the shell border; round tips 3 and 5 for the rest of the details like Winnie's eyes, eyebrows etc. and tip12 for the balloons. I totally enjoyed decorating this cake which I made for a Christmas party at a friend's place. It's actually very easy to make if you know how to. Refer the Wilton's method and you will know how simple it is. I made a 9" double layer round cake and iced it with buttercream icing (make more batches as needed). If you do not want to make the icing at home, you can use store bought icing. For the red and black icing, I used store bought Wilton's decorating icing. You get them in 4.25 oz tubes. I have given up on making both these at home since they do not turn into the colour I want and leave a hideous taste which I can definitely do without. 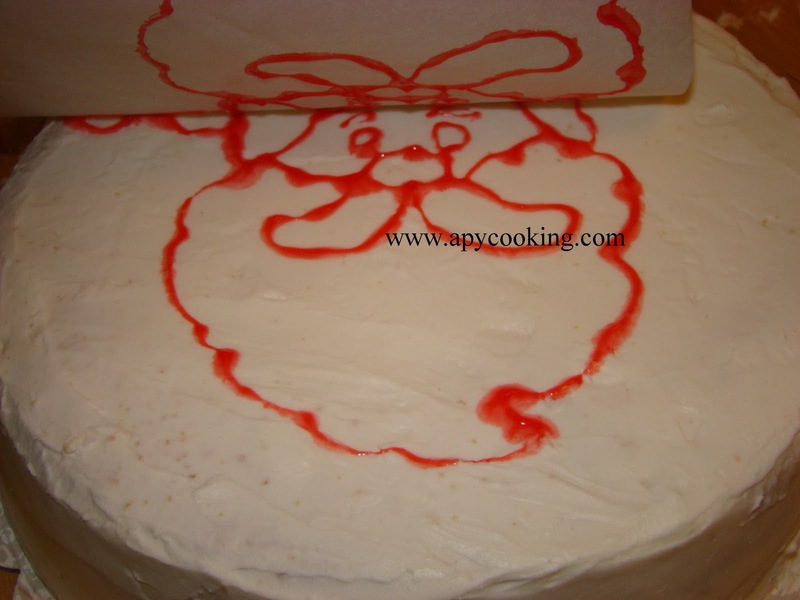 I used Wilton red decorating gel (.75 oz tube) to trace this design. I wish I had done a better job of covering the tracks of the piping gel with the icing! I'm travelling to India next week and may not be able to update my blog for sometime. 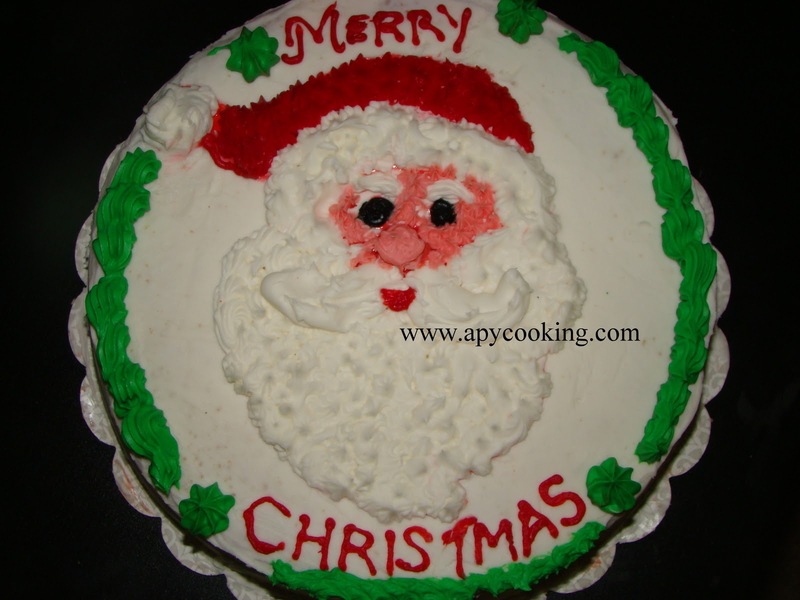 On this note, wish you all a Merry Christmas!! You may think I'm crazy but one of my favourite pastimes is grocery shopping. The bigger the store, the happier I am. And what I love about the holiday season is that you get to listen to this lovely, soothing music while you decide what pasta to pick, which herbs to choose, what bread to buy and what snacks to opt for. Ranch Market is usually the store I go to if I decide to cook Thai food. One aisle that I spend the most time in is the vegetable aisle. I like looking at the different varieties of mushrooms. Till now apart from what I usually buy - the regular, baby bella and sometimes portobello, the only variety I dared to buy were the shiitake mushrooms. This time I was very tempted to buy straw mushrooms. 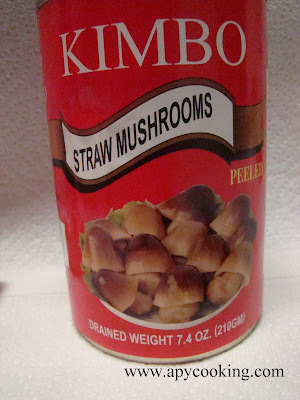 I decided to buy the peeled, canned mushrooms instead of the fresh ones. No particular reason. I generally avoid using canned products - the fresh ones are always healthier. 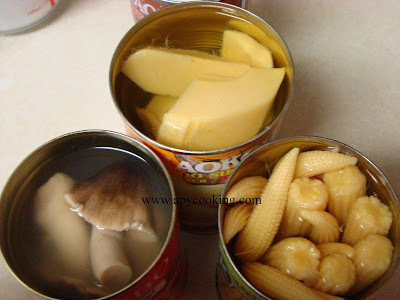 But this time tempatation took over me and I also picked up a can of baby corn. Back In B'lore I used to buy fresh babycorn by the dozen. Unfortunately we do not get fresh babycorn here. 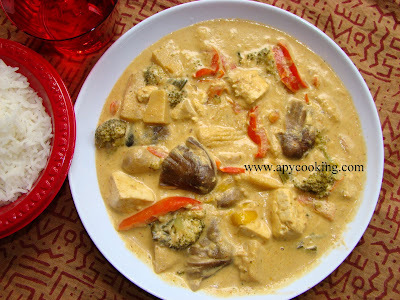 I also prefer bamboo shoots in my Thai curry so picked that up as well. So much for avoiding canned goods, I hear you saying. 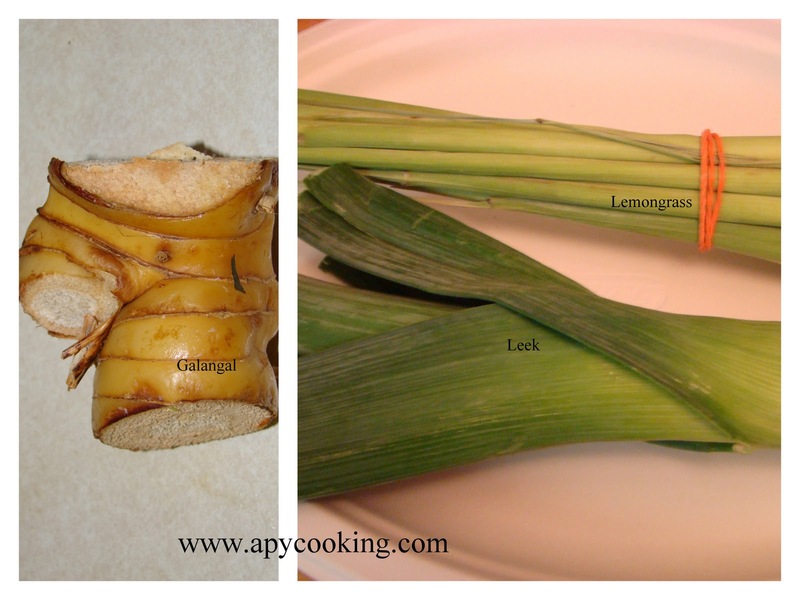 I also like large pieces of galangal and lemongrass in my curry so I picked them too and also picked some leeks. 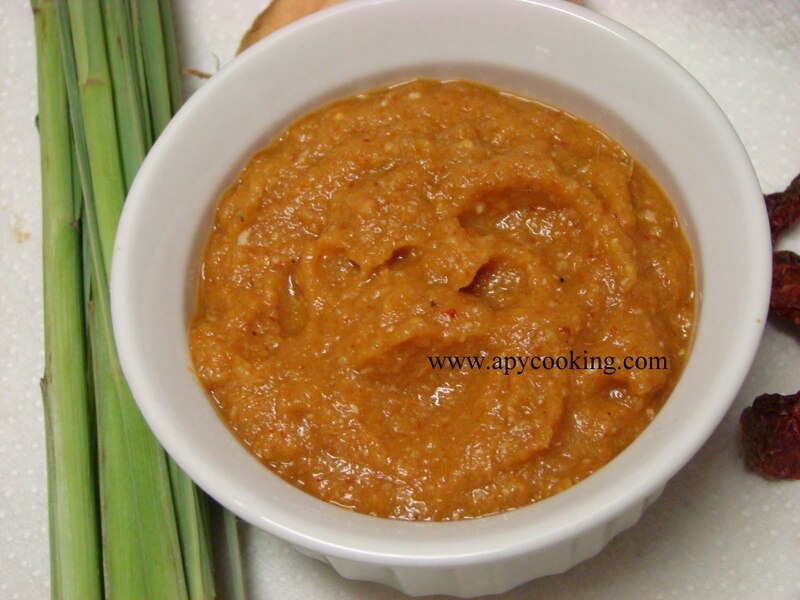 After I came home, I remembered seeing a recipe for Thai red curry paste in Nita Mehta's Vegetarian Microwave Cookbook. So instead of using store bought Thai curry paste, I thought of giving it a try. I used galangal instead of ginger, increased the chillies, decreased the peppercorns and made a couple more minor changes to suit our taste. The colour didn't please me much, but I guess that depends on what chillies you use. However, the paste did lend a nice flavour to the curry and my husband liked it a a lot, so I cannot complain. 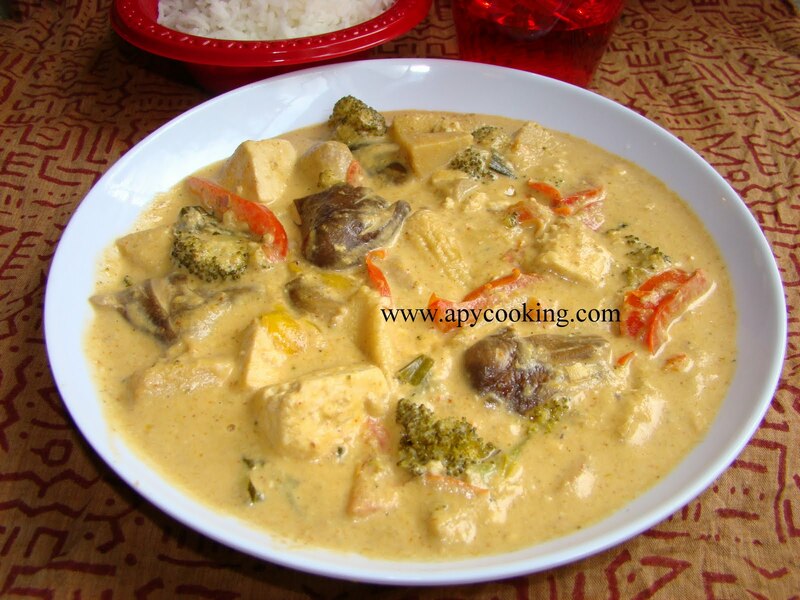 If you are using store bought Thai curry paste, just go directly to the Thai curry recipe. If you do not want to use the paste the same day, just roast it for a few minutes in 2 tbsp oil till the water evaporates. Cool and refrigerate. Whenever I make pasta, lasagna or Thai curry, I like to use different varieties of vegetables. I have mentioned a few here. Feel free to make changes and add or subtract vegetables as per your liking. I personally like to use additional lemon grass and galangal in the curry because I love the flavour given out by them, but you needn't add them as they have already lent their flavour to the paste. 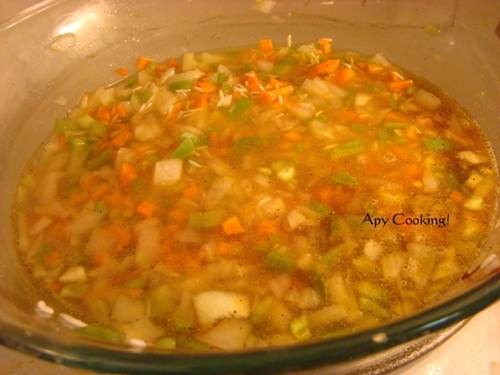 I forgot to add carrots this time, but I will include it in the list. In a large pan, heat 3 tbsp oil. Add Thai red curry paste and roast for a few minutes till the water evaporates. Add 1/2 cup coconut milk and bring to a light boil. Add all the vegetables and mix well. 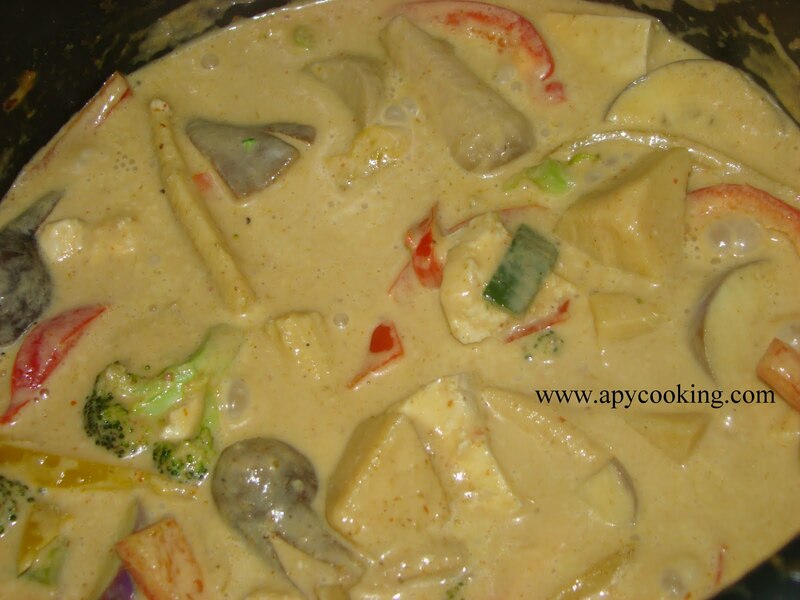 Add the remaining coconut milk and soy sauce and bring to a roaring boil. Add chopped basil and salt and boil for a couple more minutes. Adjust the spice level. Some chillies can be really spicy while some may not. I actually heated oil+1/2 tsp chilli powder in the microwave (for half a minute) and added it to the dish. One change I would like to make next time, as I mentioned, would be to try making the paste with some other type of chilli which will give me a deeper red colour. Any suggestions are welcome. Update - Thanks for your suggestions. I have updated the post accordingly. Sometimes I wish there were 25 hours in a day so that I could devote a whole hour to my blog. But if I were granted even 30 hours a day, I'm sure I'd need just one more! I'm typing out this post at 1 in the morning, after putting my son to bed a couple of hours ago and folding a truck load of clothes while watching my favourite show - Food Network Challenge. I find folding clothes one of the most boring things you could ever do and keep myself happy by watching something fun on TV. 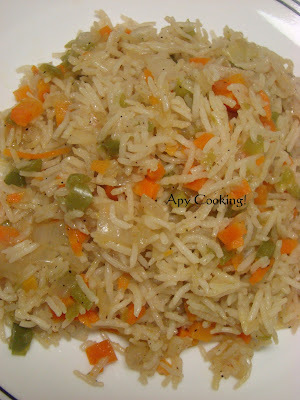 Coming back to my post, this recipe is from Nita Mehta's Vegetarian Microwave Cookbook . The book was gifted to me by a friend (whose first name incidently happens to be Neeta. Not Mehta, Pai.) The dish is a quick solution to those busy days when you have neither time nor energy to cook anything elaborate. 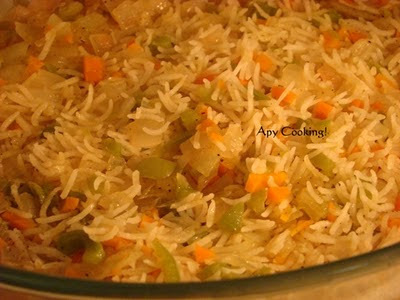 Soak rice for 15 to 20 minutes. 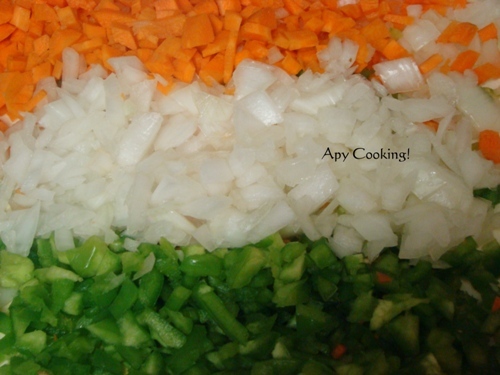 Meanwhile chop onions, carrots and capsicum. Drain out all the water from the rice. 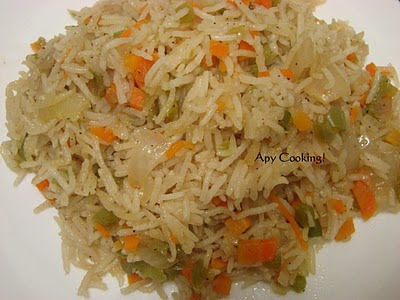 Add this rice to the vegetables. Pour two cups water, salt, pepper and soy sauce. Mix a bit and microwave covered for 13 minutes. Stir once in between. Leave untouched for 5 minutes. Mix well and serve hot.